Diversity in Silicon Valley has been topic of much discussion recently. There is no need to look at the statistics to know tech industry is suffering (severely) from lack of diversity. To fulfill my curiosity, I decided to add up the numbers from some random companies I was interested in. The results for both gender and race/ethnic diversity are in the following graphs. Now what if we look at some tech companies who have published their employee “diversity” information? Would the results compare? Now, I started to wonder how it compares with other industries. For example, medical fields. Just looking at the overall figures from US Department of Health and Human Services yields these graphs. Race ratios in some health care categories (omitting speech and RNs), as compared with select tech companies. Whites are around 77% of the latter, while in tech this is 53%. Gender ratios in some health care categories, as compared with select tech companies. While tech is mostly compromising of men, health care professionals in the data chosen are mostly female. Of course, we are comparing 4.8M jobs in health care with 227K jobs in companies I almost randomly selected in tech sector. But still, as you see the overall health industry is mostly a female business (73.98%) while the tech industry is “ruled” by males (71.79%). 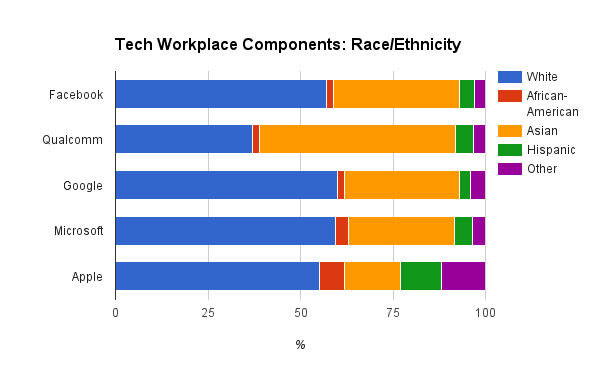 It also looks to me that health industry is even more “white” than tech, with 78% vs. 54%. I find it hard to come to conclusions with this basic data. I’m sure a data scientist (or statistician) can do wonders. To me, this all looks like evidence that tech industry is in focus of diversity only because we “techies” have always tried to be the ones doing the right thing. I firmly believe there is a philanthropic side to us techies. The fact that many of us were branded as “geeks” and “nerds” and similar negative terms means many have the thirst for justice. Being on the receiving side of bullying is not something desired. I very much agree that tech industry needs a more diverse population. But I also believe that we have to understand this is just one industry. The problem is not necessarily just limited to tech. But by correcting this industry, we might be able to set an example for the other fields. Still, the race/ethnicity backgrounds still look too “white” (77%). This entry was posted in General, life and tagged diversity, ethnicity, race, silicon valley, tech. Bookmark the permalink.